Powerful sprayers with Viton seals for greater chemical resistance. 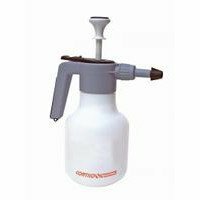 Heavy duty plastic lance with conical spray nozzle, adjustable carry/ shoulder strap, durable polyethylene body with pressure release valve/ indicator. Now available in 5 or 10 litre. This 1.5 litre spray bottle is a alkaline resistant pump-up sprayer with superior performance, it has an adjustable nozzle from fine spray to powerful jet. The EPDM seals protect this sprayer from alkaline products.